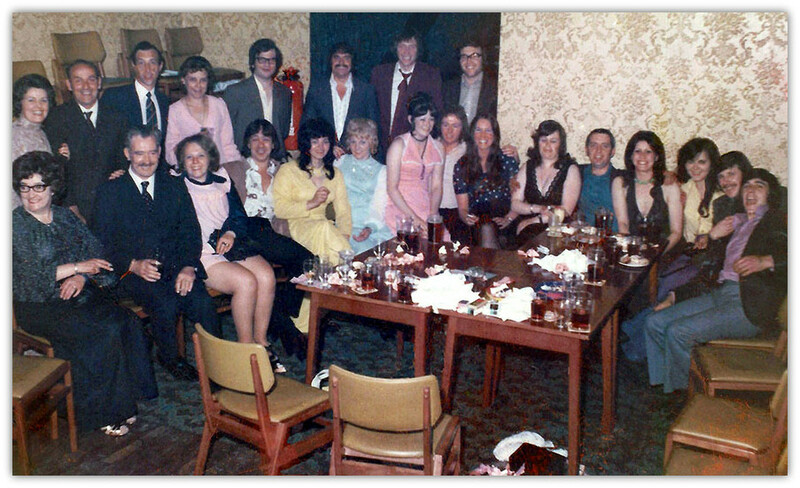 Hi there Fionn just found this photo of the staff from Ilkeston Rescue Station at a Medals Awards evening at the Ilkeston Co-op, I believe it was around 1973. YOUR work commands the respect and the gratitude of all of us in this industry, from the Divisional Board to the newest recruit," said Mr. R. V. Edwards, Finance Director to the East Midlands Division of the National Coal Board, addressing a gathering of volunteers connected with Ilkeston Mines Rescue Station, at the Miners' Welfare on Friday night'. Long-service medallions and certificates were presented to 28 rescue workers by Mr. Edwards. 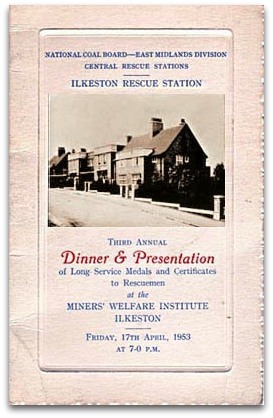 Mr. Edwards recalled that Ilkeston Rescue Station was the first he visited, in pre-nationalization days, when he was secretary to the North Midlands Colliery Owners Rescue Station Co. "It was here that I first learned of the type of work which was performed by the Rescue corps and about the training they give to the brigades at the collieries," he went On. "That was some 10 years ago, and ever since I have always been - very interested indeed in the work that is carried out by rescue stations in this division." Mr. Edwards said that from everyone's point of view, the less the rescue workers were in action the better but it was a source of great satisfaction to know that they were there if required. "You are there voluntarily, with a spirit of firmness of purpose on which we know we can rely, on which each workman in the industry knows he can rely, and on - which the wives and families of all of us know they can rely," Mr. Edwards added. "I hope you will take my presence here tonight as a token of the Interest that the Divisional Board take in the work that you are doing and in the Preparedness which we know you will always display. "I hope you will also take it as a token a our deep and sincere gratitude for everything you do for this great Industry for which we are responsible to the whole nation." " Mr. Edwards said he hoped the work of the rescue corps would continue to be appreciated without having to receive recognition or publicity from being in action. "The work is there whether you are called upon or not," he concluded. "That is what we want and that is what were recognise, that is what we are so proud of and so grateful for." Mr. W. Unsworth, No. 5 Area general manager, was in the chair. Medallions were presented to members who have completed exactly five, ten or fifteen years. In addition, of course, there were many rescue workers present whose service falls between these periods-and some whose service exceeds it. 15 years: L. Calladine (Permanent Corps). 10 years: J. W. T. Harrison, S. Hassall (Stanley), C. Daykin (Hucknall), H. Hartshorn, J.A. Martin (Mapperley), W. Thorpe and W. Mann (Coppice). 5 years: K. Abbott (Pye Hill), R. Ford (Denby Hall 'B'), L. Buckby (Selston), G.W. Baker, L.C. Rudd (Woodside), W. Tye (Cinderhill) W. McGee, J. Nicholas (Glifton), W. Taylor (Linby), W. Whalin, J. Deaton, J. W. Smith (Wollaton), A. W. Cullen (Cossall) H. Stone (Denby Hall), J. Weatherbed (Radford) and A. Crooks (Woodside). In addition, long-service certificates were presented to four members who have reached retirement age-John S. Chambers, Selston (18 year),' Sidney C. Shelbourne, Coppice; Harold J. Turton, Gedling; and Waiter Ford, Denby (all 14 years). The presentations were made at the corps' fourth annual dinner. An entertainment by the Revellers Concert Party, of Belper, followed. Guests included Dr. J Trefor Watkins (Divisional Medical Officer) Mr. W.A. Wood (Divisional Safety Engineer), Dr. T. A. Hunt (No. 5 Area Medical Officer), Mr. P. C. Parry (No. 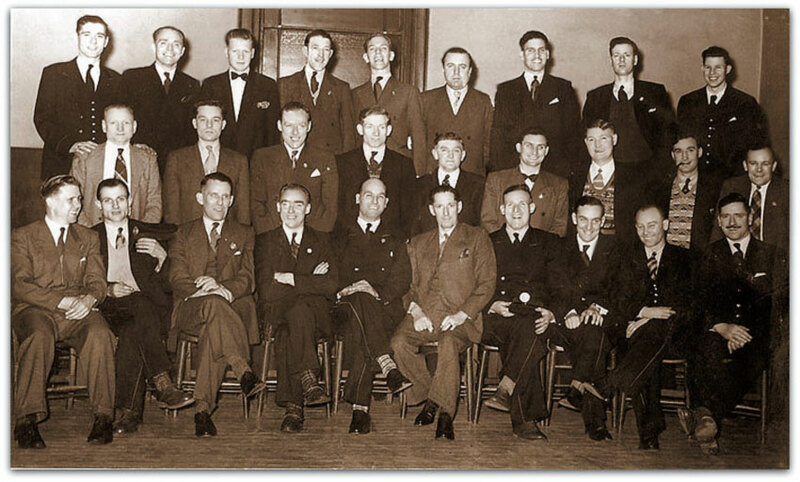 1 Sub-Area Manager, Mr. G. Jenkins (H.M. Senior Inspector of Mines, Nottingham), Coun. H. E. Parkin (President, Derbyshire Area N.U.M. 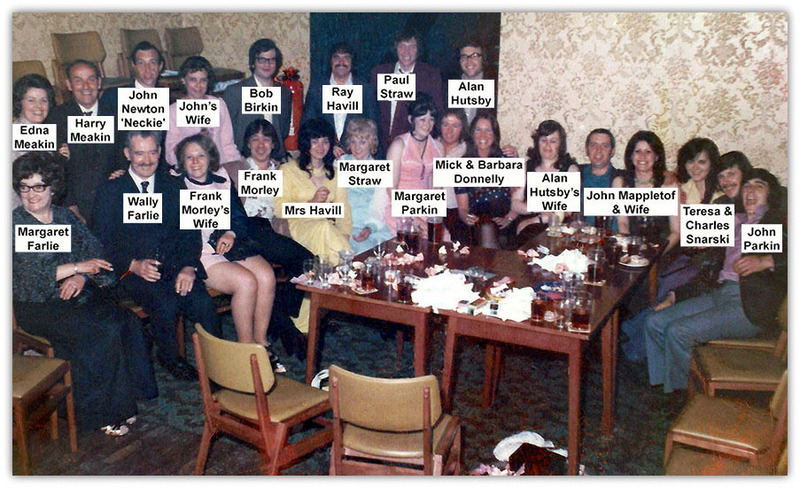 ), Mr. E. J. Ley (President, Nottinghamshire (President, Ilkeston Miners Welfare), Ald. J. Henshaw (Secretary, Ilkeston M.W.) and Mr. A. J. G. Coulshed (Divisional Rescue Stations Manager).